We got a new arrival today at the CGQ offices. I bought the digital version of Atlantean when it was released (to play on my Everdrive), but couldn’t resist having a physical copy. Atlantean is a pretty neat game. Think Defender (Arcade) meets SeaQuest (Atari 2600). Really nice graphics, and great music. This is the third physical release for the TurboGrafx from Aetherbyte, after Insanity and Pyramid Plunder. If you want to get a taste of what this game is like, you can play a simpler (and Christmas-themed) version for free by downloading the ROM straight from Aetherbyte’s website. They also have a second free-to-download homebrew game called “Reflectron”. Getting this game today got me thinking: With the price of old games at an all-time high (too high, in my opinion) maybe your money is better spent buying new games for your old systems. I could have dropped $60 on some over-inflated Super Nintendo game, the money just going into the pocket of an eBay reseller, but instead I spent the money on this, with the money going directly into the pocket of the developer. I think that homebrew efforts like this need to be supported. Yeah, retro-style games for PSN or XBLA can be fun, but it just ain’t the same. 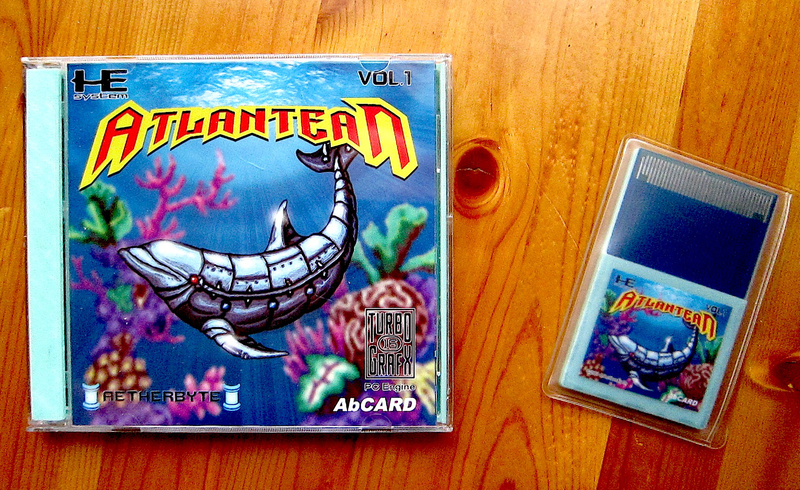 Tagged 2014, Atlantean, Homebrew, HuCard, PC Engine, Shooter, turbografx, turbografx-16. Bookmark the permalink.